A meniscus lens is not a usual off-the-shelf purchase as they have a specialized use in small spot size focusing and collimation. These lenses provide greater performance specifications at a minimal price increase over typical lenses. Because of the spherical nature of lenses it means that parallel rays, especially those from various distances, do not converge at the same point on the lens. Spherical aberrations can be corrected through the addition of multiple elements that will account for and overcorrect for the differences. In infrared technologies, though this could significantly impact the overall cost of the technology. Rather than including multiple elements to account for the spherical aberrations, using a meniscus lens could be the answer. 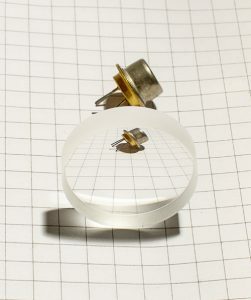 When working in the infrared, aka non visible light spectrum, the meniscus lens will cause the light to bend less than it would if working with visible light on plano-convex glass. A meniscus lens can also enhance performance in the visible light spectrum although users don’t typically see enough increased benefit to offset the additional costs of manufacturing the meniscus lens for specific use. Meniscus lenses will not increase benefits in all applications but it has certainly been proven to enhance performance at a moderate cost increase in spectroscopy and thermal imaging applications. UKA Optics manufactures standard and custom lenses for image capture, barcode scanning, night vision systems, medical systems, high-speed imaging, machine and robotics vision. The engineers at UKA can provide advice on which type of lens is best for your application.